Blue Marlin Apartments 1,2,3 and 4. * Town of Kure Beach 2011-2012: In legal efforts to maintain our oceanfront access and views we installed 4 private parking space located at 317 Atlantic Avenue. These "extra" spaces are offered for downstairs guest only. Like other beach-front communities, parking issues have become a detrimental topic. Apartments 1,2,3 and 4 are oceanfront. * Page down for more details. Accommodate a maximum of 6 person . 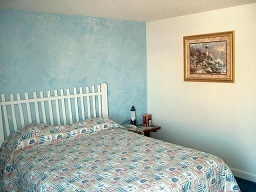 ** Two queen private bedrooms and the third queen bed in the combination room. Linens are furnished. 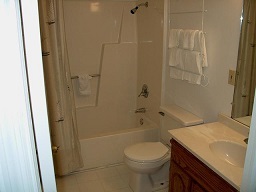 One full bathroom. Kitchen with oven, 18 cubic foot Kenmore Refrigerator, microwave oven, coffee maker (coffee not included), can opener, basic utensils, cabinets and double sink. Living room area with sofa, loveseat and chair. Wi-Fi plus "Charter Cable" TV with more than 45 channels. The third queen size mattress. Central heat and air condition. Individual 40 gallon hot water heater per apartment so no other unit uses your hot water. 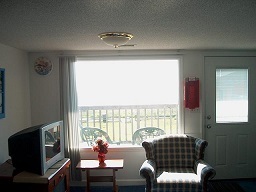 Apartments 3 and 4 are upstairs with an oceanfront balcony. 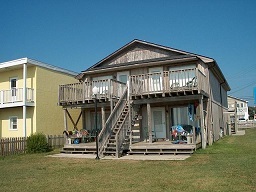 Apartments 1 and 2 are downstairs and with an oceanfront back porch . 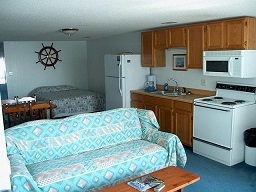 **In an effort to provide you safe comfort and show consideration for other lodging guest, apartments 1,2,3 and 4 accommodate 1 - 6 persons, maximum. Non-walking infants do not fall into the occupancy’s count. Unfortunately, we cannot provide safe cribs and blankets for infants, but you are welcome to bring your own items.